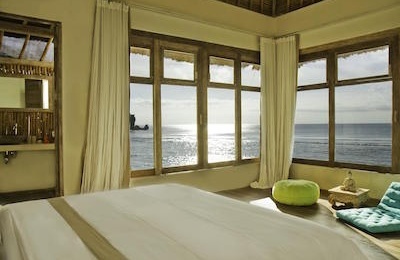 Praya Surf Hotel - Kuta, Lombok Guests overall rating: ★★★★★ 5 based on 4 reviews. 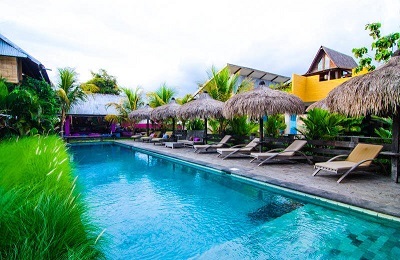 Located just 2 km from the Airport, Lombok Hotel is perfect for a short stay in between travels. 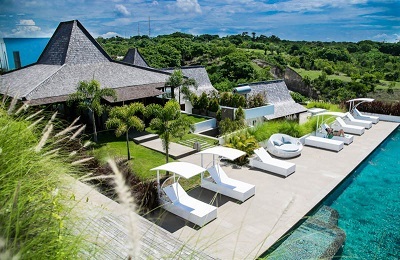 Ideal place to relax and recharge while traveling across Indonesia. Enjoy hot showers, air-conditioned spacious rooms with comfortable large beds. If you are and experienced traveler, you already know how much you need a few of nights of comfort. If you are new to exotic, tropical travels, you will definitely appreciate a state of ease and relaxation this hotel has to offer at moderate price. Free breakfast for all the guests. Lombok Hotel is located in Praya, Lombok, close by airport and 16 km from Kuta Lombok. Green lush mountain views from most of the rooms. There are number of shops and cafes around to get out for a meal. However, the Hotel offers a delicious menu consisting of indonesian specialties and internationally beloved burgers and pastas. All the rooms are air-conditioned and equipped with a flat-screen TV. Fitness centre and an outdoor swimming pool to rejuvenate from exhausting travels. Each room features a private bathroom with comfy slippers, free toiletries and a hairdryer. Free Wifi and a 24-hour front desk. All the rooms are air-conditioned and equipped with a flat-screen TV. Green lush mountain views from most of the rooms. Each room features a private bathroom with comfy slippers, free toiletries and a hairdryer. Water boiler, tea, coffee and water in the room. Hotel restaurant offers a delicious menu consisting of indonesian specialties and internationally beloved burgers and pastas. Each stay in the hotel includes a free breakfast at Hotel restaurant. These spots will also deliver a lot of fun for longboarders. Many of island’s spots are most suited for intermediate to advanced riders. There are waves all along the south coast, with the most popular being Mawi as it picks up the most swell and can turn into a hollow right on mid to low tide. The Hotel offers an outdoor pool with comfortable sun beds. Spa and gym facilities at your disposal at moderate additional fees and offer many benefits for your wellbeing. Take your time to sleep in, rejuvenate by the pool, and try out delicious Indonesian cuisine. Other option is to ask help from the lovely hotel staff to rent a car and go explore the island. Lombok Hotel is located in Praya, Lombok, 2 km from Lombok International Airport and 16 km from Kuta Lombok. Green lush mountain views from most of the rooms. Suite Room 825 000 IDR/night 2 Pers. Executive Room 725 000 IDR/night 2 Pers. Deluxe Room 625 000 IDR/night 2 Pers. "We arrived After a stressy flight day and all our sorrows vanished in This hotel. Modern furniture, confy bed and extremly nice and helpful staff. We stayed one more day to enjoy the Swimmingpool, gym and terrific breakfast Buffet. Price is more than reasonable. Waterboiler, tea, coffee and water in the room. Dinner in the Restaurant was tasty. We would come back every time." "My husband and I stayed here for 1 night so that we were close to the airport. The room was an adequate size, it was clean and very comfortable with a lovely clean shower/toilet. Great TV channels in English which suited us. The breakfast in the morning was very varied and met all tastes. There is a lovely pool and a bar area on the 2nd floor. The hotel as a newly opened food court around the side, it is a lovely traditional design, large and serves a range of asian cuisine for a very reasonable price." "We stayed here for our trip in Lombok.. we had 2 days here. I think we should have all of our days in Lombok here, because this hotel is in the best location, it is right in the middle of Lombok. Location Great Location in Lombok [According to me, subjective] : Pink Beach, on the South eastern of Lombok, best beach so far, best snorkeling spot, even better than 3 Gilis. Kuta Beach, on the Southernmost of Lombok... not as good as Pink beach, but it is better than Kuta Beach Bali Mataram City, main city in Lombok that has all the delicious food... Tanjung Aan, Bukit Merese great hill with great view 3 Gili via Bangsal, near Senggigi We rented a car for our trip, Lombok is quite a small island, you can get from East to West in 2 3 hours. and every night, if we're exhausted, this hotel just sit in the right place for us to take the break. Food They had buffet breakfast, quite delicious food, and everyday they change the menu Price I think we good really, really cheap price compared to what we got here"
"We stay there one night so that the next day we can go to Lombok Airport at very early 5 a.m in the morning. The hotel have free shutter car to airport, which is only 10 minutes driving from the hotel. Overally, room is clean, staffs are nice. We left hotel at 5 a.m but they still prepare 2 big box of breakfast for us so we can eat at the airport. I think the service here is professional and quite good. Although we don't have much time to try on swimming pool or other facility, I can see the hotel is operated in a very professional way !"